George Washington died in his bed at Mount Vernon, Virginia, on December 14, 1799. As a Revolutionary War hero and the new nation's first president, Washington's life and death led to his glorification as a key iconic, mythological figure in United States history. The death of this founding father posed a threat to the emerging social identity that could only be resolved by massive, communal ceremonies celebrating his life, and his essential contributions to the birth of the new nation. Born on February 22, 1732, in Westmoreland County, Virginia, Washington's early life included working on the family plantation and a short stint as a local surveyor. The French and Indian War (1754–1763) offered the Virginian a new career opportunity in the military, where the young Washington was quickly promoted to lieutenant colonel. In 1755, at only twenty-three years of age, Washington became a colonel and was appointed commander in chief of the Virginia militia. He left the army in 1758 and returned to Mount Vernon, when he married Martha Dandridge Custis and entered the political arena as a member of Virginia's House of Burgesses from 1759 to 1774. During this time Washington became a fierce opponent of British colonial policies, especially those relating to discrimination of colonial military officers and to western expansion. Washington then served as a delegate to the First and Second Continental Congress (1774–1775), and in June 1775 Congress unanimously favored his appointment as commander in chief of the Continental forces. His leadership during the American Revolution, and his storied military exploits, including his crossing the Delaware River on Christmas 1776 for a surprise attack, contributed to his growing popularity as a both a warrior and civic leader. After the war Washington returned once again to Mount Vernon to work the land for a short time before leading the Virginia delegation to the Constitutional Convention and, eventually, assuming the office of presidency in 1789. Despite deep divisions in American political life during his first term, Washington was elected to a second term in 1792. After this term finished, he retired once again to Mount Vernon and remained there with Martha until his death in 1799, when he was entombed on the grounds. Washington's death led to unprecedented levels of public mourning in the new nation. Rather than create debilitating social grief, his passing served as a critical source of cultural rejuvenation and optimism about the future of the young nation. In towns and villages throughout the land Americans celebrated his death with local ritual activities (which often included mock funerals) that produced deep and long-lasting forms of social solidarity uniting disparate regions in common cause to mark the occasion of his passing. Although these celebrations were tinged with sadness, they also provided significant opportunities for Americans to symbolize and celebrate both the mythic qualities associated with the man and the national virtues associated with the new republic. Memorialization efforts began immediately, with the production of mourning art—which combined traditional genres of expression with innovative, more spontaneous expressions of sadness—playing a crucial popular role in efforts to publicly remember the national hero. The various symbolic motifs found in this art, ranging from ancient images of mourners in classical dress to Christian imagery invoking resurrection and redemption themes and common allegorical figures like America, Columbia, and Father Time, gave citizens a shared frame of reference to imagine his life and continuing presence in American life after death. All of these motifs in mourning art produced at the time of his death reinforced the linkages between Washington, patriotism, and Christianity. The art also established a cultural link between death and the regeneration of national life that would prove to be so critical to the elaboration of a distinctly American form of civil religion, and that would be repeated throughout the course of American history with the passing of such critical political figures as Thomas Jefferson, Abraham Lincoln, and John F. Kennedy. For artists, politicians, ministers, and other leaders, remembering the spirit of Washington translated into a spiritual practice that nourished nationalism and civic renewal. Rather than reaffirm social distance between classes, in death Washington added fuel to the fires of democracy and egalitarianism: His life not only taught Americans about virtues like hard work, love of country, and the value of home life, it conjured now-mythical stories about the birth of the nation and its future destiny. In addition to his central role in the political life of the nation, Washington could be understood as America's first celebrity. His death became a time for ardent fans to mourn collectively, and discover innovate rituals to worship his memory. The open forms of public display surrounding his death set the mold for later collective exhibitions of adoration, identification, and deification. Pike, Martha V., and Janice Gray Armstrong, eds. A Time to Mourn: Expressions of Grief in Nineteenth-Century America. Stony Brook, NY: The Museums of Stony Brook, 1980. Randall, Willard Sterne. George Washington: A Life. New York: Henry Holt, 1997. Schwartz, Barry. George Washington: The Making of an American Symbol. New York: Free Press, 1987. 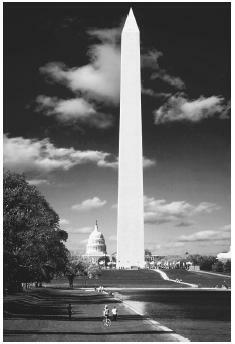 Construction of the Washington Monument began in 1848, although its design was significantly altered in 1876 to slightly resemble an Egyptian pyramid. The completed monument was opened to the public in October 1888; it stands just over 555 feet tall and an elevator takes visitors to the observation area in the pyramidian.